In a country where politics is dominated by tribal chiefs, village mullahs and unsavoury warlords, the people of Afghanistan will tomorrow be treated to a unique exercise in modern democracy. Millions of Afghans are expected to tune their televisions and radios in to the country's first televised debate between the leading contenders in next month's presidential election. The organisers had hoped the debate, modelled on the set pieces of US presidential politics, would see the incumbent, Hamid Karzai, square off against his two main rivals – his former finance minister, Ashraf Ghani, and his former foreign minister, Abdullah Abdullah. But Karzai, who has been waging a traditional campaign focused on winning over ethnic and tribal powerbrokers through backroom deals, has decided not to risk a Nixon moment. After days of uncertainty, Karzai's campaign announced that he was pulling out 24 hours before the debate was due to begin, claiming that his policies were not ready. The president, whose popularity has taken a battering during eight years leading Afghanistan, will now watch his two closest rivals soak up two hours of prime-time television. The show's producers, who have held endless negotiations with the three campaigns about the format of the debate and topics for discussion, have vowed that his empty podium will be left on the set – a move which has infuriated Karzai's aides. A spokesman for Karzai said that the president could take part in a debate only if it was broadcast on all of Afghanistan's television channels, and said Tolo TV, the hugely popular network, was biased against the incumbent. Ghani, a western-trained technocrat who was once mooted as a secretary general of the UN, said todayit was "yet another broken promise" by the president. "For the first time in our history we have the opportunity to come together virtually to see what our potential leaders have to offer. But he doesn't want to debate because he does not have a record to explain," he said. As with any election the incumbent has the most to lose from a debate in which his enemies can attack his record. Tolo, an independent-minded channel in Kabul that broadcasts in Persian, is determined to attract as many viewers as possible, simultaneously broadcasting the debate on its Pashtun sister station as well as on its nationwide radio station. The mediator, Mujahid Kakar, is well-prepared for the debate after being the only Afghan journalist to have covered last year's elections in the US. "Being in Chicago when Obama was declared winner was one of the most exciting moments of my life. I covered all the debates so I know how important these events can be," he said. But with Afghanistan's experiment with direct, democratic, elections being just five years old, no one knows whether the debate will have an impact similar to that seen by the US contests. Sceptics say that the country has not yet shaken off the influence of ethnic and tribal power brokers over a largely illiterate and traditional population. But Jahid Mohseni, one of the owners of Tolo TV, believes the boom in independent media in Afghanistan in recent years has helped to level the playing field and introduce a more modern form of politics. He said: "Tribal and ethnic considerations are much less important than they were, particularly in the cities. And debates like this help to force leaders to talk about the policies we will all have to live with for the next five years." Ghani, meanwhile, hopes to appeal to independently minded voters and has been waging a "very 21st century campaign", in the words of one western diplomat. His side boasts an Obama-esque website and often emails several press releases in a day. Ghani has called in favours from top political operators within the Democratic establishment in the US. These include James Carville, the strategist who masterminded Bill Clinton's first presidential campaign. Karzai, however, appears to betting heavily that it is business as normal and has so far not bothered to publish a manifesto nor hold more than one big public rally. "He still doesn't think that he is a candidate!" said Abdullah, an eye specialist who rose to prominence during the 1980s and 1990s when he served as an adviser to the resistance leader Ahmed Shah Massoud in his battles against the Russians and the Taliban. "After turning down a golden opportunity like this to talk to the nation I don't think he can expect the people to listen to anything he has to say." The president has held meetings with tribal chiefs and leaders of the main ethnic groups, trying to win over their support with the promise of jobs or assistance when he is elected. Karzai has been happy to court even the most unsavoury of Afghanistan's power brokers, including Marshal Fahim, a former warlord, whom he selected as his vice-presidential running mate. The president is widely reported to have offered them cabinet posts, governorships and even the creation of new provinces in return for their support. It has also emerged that he has pardoned five heroin smugglers, one of whom is related to the head of Karzai's election campaign, although he denies the election has had anything to do with that decision. Western diplomats are concerned that deals made for electoral purposes will derail efforts to curb corruption and improve government effectiveness – tasks that are seen as essential for draining popular support for Taliban insurgents. Nonetheless, the flurry of deal making won Karzai the support of most of the country's power brokers months before official campaigning began, which led many observers to assume he had the election sewn up. Some believe, though, that Karzai has over-reached himself. "Karzai is counting on warlords, but I think he has misjudged the number of votes," said a western expert with years of experience in Afghanistan. "People don't look at the jihad era and see Dostum [an Uzbek strongman, accused of war crimes] and Fahim as heroes – they are pretty much loathed by the population. One of the reasons the Taliban are coming back is because of warlordism." Ghani believes the president's aura of invincibility burst when the US ambassador to Afghanistan, Karl Eikenberry, held meetings with the leading opposition candidates. This was seen by many Afghans as a sign the Americans were distancing themselves from Karzai. Karzai's office denounced the meetings as "direct interference" by the US in Afghan politics. "And he is having problems in the south and east where they are really angry with the president," Ghani said of the insurgency-wracked Pashtun areas of Afghanistan which should be Karzai's heartland. Others blame a lacklustre election campaign. "Karzai's campaign resembles the way he runs the government," said a leading Afghan businessman. "People are trying to steal money left, right and centre. Even his posters were of the substandard quality and the glue used comes off in a few nanoseconds." It is Abdullah who is regarded as the main threat to Karzai's re-election chances, after winning the backing of Ustad Atta Mohammad Noor, the powerful governor of Balkh, a northern province seen as a beacon of prosperity and security. 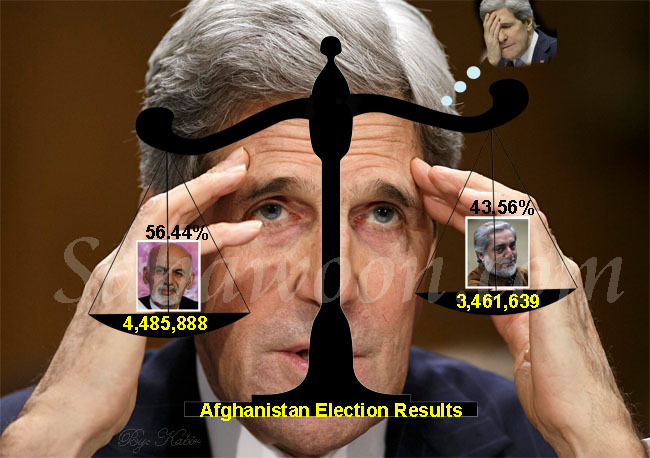 One UN official said Karzai would be in grave danger if he failed to win more than 50% of the votes, forcing a run-off. "It is increasingly likely that it could go to a second round. If that happens then Abdullah and Ghani have an opportunity to take him out. If they get agreement among themselves they have the potential to unseat him." KABUL:- President Hamid Karzai said Wednesday he will not take part in Afghanistan's first major televised presidential debate, leaving his top two challengers to talk among themselves. A debate was scheduled to take place Thursday on the most-watched TV network between Karzai, former Foreign Minister Abdullah Abdullah and former Finance Minister Ashraf Ghani. But after Karzai pulled out with barely 24 hours to go, an aide to Abdullah said the former foreign minister might not participate either. Ghani, a former top World Bank official, has repeatedly needled Karzai to debate him. Karzai has pledged to take part in debates. "It is the Afghan public that will suffer another broken promise, not any presidential candidate, if the future plans of each candidate is not made clear standing side-by-side his/her rival," Ghani said on his Web site this week. Karzai's campaign said the president wouldn't take part because more of the country's 41 presidential candidates weren't invited. The campaign also said it had received an official invitation only one day before the debate. Jahid Mohseni, the chief executive of Moby Group, which owns Tolo TV, said the station hoped to hold a series of three debates, and that Karzai was welcome to join the remaining two. Mohseni said negotiations over Thursday's debate began more than three weeks ago. He noted that Thursday is exactly four weeks before the Aug. 20 election, and there hadn't yet been any debates. "Afghanistan's obviously a new democracy and we've got a lot of limitations in terms of communication and road structure," Mohseni said. "We saw a TV debate as useful because it crosses barriers in terms of literacy, and candidates can talk to voters in their own homes." Without Karzai present, Abdullah was also considering pulling out of the debate, said aide Ali Farhad Howaida. But Ghani still planned to take part, said Ajmal Habidy, a Ghani aide. "If President Karzai is not participating in the debates, it shows his weakness," Habidy said. Though Karzai's popularity has slipped in recent years, none of his challengers is expected to be able to defeat him unless they combine their campaigns and back a single candidate.